It’s the moment we’ve all been waiting for, and the moment the Wisconsin Firearms Coalition has been preparing for! 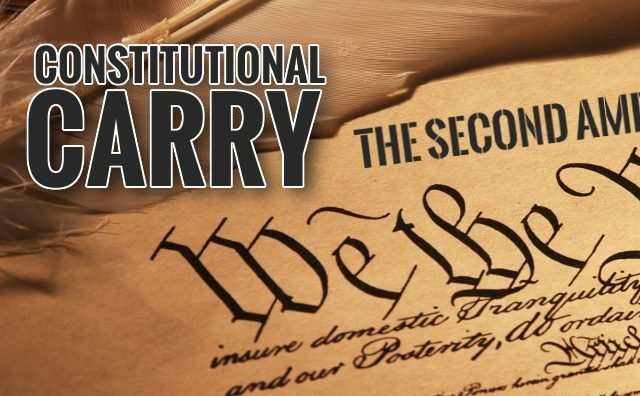 Constitutional Carry has been filed in both the Wisconsin Assembly and the Wisconsin Senate. More, the bill already has an impressive 44 co-sponsors and we hope to keep increasing that number! But the fight has just begun. Already, the notoriously anti-gun groups in Wisconsin, such as the Wisconsin Anti-Violence Effort, are threatening an all-out war against this legislation. And of course, radical NYC billionaire Michael Bloomberg’s front-groups are also ALREADY mobilizing to defeat this pro-gun legislation in Madison. In addition, notoriously anti-gun legislators like Rep. Melissa Sargent and Rep. Chris Taylor are doing everything in their power to defeat this legislation from within. That’s why I need your help today –- more on that below! As a reminder, Constitutional Carry is a very simple idea: if you’re legally allowed to own a firearm for self-defense, you’d legally be allowed to carry that firearm for any lawful purpose without having to pay hefty fees or have your name added to a government database. That’s how it’s done in states like Vermont, Alaska, Kansas, Maine, Wyoming, Arizona, Arkansas, West Virginia, Idaho, Mississippi, Missouri, and New Hampshire. Even as I type this, North Dakota just passed Constitutional Carry and joined New Hampshire as the second state to enact this legislation this year! Clearly, the time is right for Wisconsin to become the next Constitutional Carry state. >>> Make the carry permit optional. If you still want to get a permit for reciprocity reasons you can, but it would be your choice. >>> No longer require you to submit your name to a government database that can be exploited by anti-gun individuals and put you and your family at risk as we have seen done in other states. >>> Remove the requirement for you to have a license to carry if you want to leave your firearm in your vehicle while you are at work. But I’m afraid this might not happen if you and I don’t ramp up the pressure in Madison –- and fast. While we have powerful anti-gun forces arrayed against Constitutional Carry legislation, the biggest threat may simply be a loss of momentum! Within an hour of LRB-2039/1 being announced, the anti-gun groups started squealing and telling their supporters they are going to fight tooth and nail to stop it. So, it’s absolutely vital that you and I make sure both chambers of the Wisconsin legislature know that you expect them to not only co-sponsor the legislation, but to also encourage committee members to ensure its passage without weakening amendments! Don’t let them think that gun owners have grown tired of defending their 2nd Amendment rights! Please contact your Representative and Senator right away and tell them to co-sponsor this legislation if they are not already on board. The April 4th deadline is coming up quickly for them to add their name as official co-sponsors! So please go to the link here and type your address in the search box. Once you do that it will pull up your Senator and Representative’s phone numbers and emails! In addition, you can call the Wisconsin Legislative Hotline to find out who your legislator is. Their number is 608-266-9960. Once you’ve made your calls and sent your emails, I hope you’ll consider a generous contribution to the Wisconsin Firearms Coalition to enable us to get the word out and mobilize as many gun owners as possible into this fight! We are using direct mail, email blasts, targeted social media, and more — trying to make sure that EVERY pro-gun Wisconsin citizen calls and emails their legislators -– and these programs cost money. Whether you can make a major investment of $500 or $1,000 as some have already done, or whether $50, $35 or even just $10 represents a major sacrifice, please do what you can right away to help us keep the pressure up in Madison! Thank you for all you do in defense of the 2nd Amendment. P.S. Constitutional Carry legislation (LRB-2039/1) was introduced today in Madison! More, the bill already has an 44 co-sponsors between the Assembly and Senate. But politics runs on momentum and it’s vital that you and I maintain the pressure, especially since the bill is already taking flak from numerous anti-gun organizations. Please take a moment today to contact your legislators and urge them to sign up as a cosponsor TODAY! The deadline for your legislators co-sponsor this bill is April 4th, so act now! Once you’ve done that, won’t you please consider a donation to the Wisconsin Firearms Coalition to help us mobilize as many gun owners as possible? Your gift, regardless of the amount, will be put right to the task of maintaining the pressure here in Madison. I have placed calls to our state senators, and local representatives. Have not spoke with anybody directly, but leave my opinion!